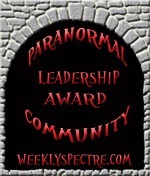 Recently, the wonderful Courtney Mroch presented me with a paranormal leadership award. I am deeply honored that she thought of me for this award. I was also honored to be included in a group with Ghost Theories, Ghost Eyes, and The Weekly Specter. You should stop by www.hauntjaunt.net/blog/ to see the rest of the wonderful blogs on Courtney's list. Although there were no rules or expectations connected with this award, I wanted to pass it on to some of my favorite paranormal bloggers out there. I have many favorite blogs but these are my favorite paranormal blogs! 6 The Weekly Specter: This award started with the Weekly Specter and I'm sending it back. This is definitely a blog worth reading. Sadly the blog will be shutting down so this is my farewell to one of my favorite blogs. I'll miss reading your posts! Thank you Jessica, I totally appreciate it. I will have to pass it on to some more cool blogs. Thank you, very much! I feel quite honoured to be in your list of favourite blogs and to now have an award. I really appreciate this! Thank you again. Thank you so kindly! In fact, I have a couple things I do need to jot down. One being at Thomas Jefferson's Poplar Forest with the 5th grade class yesterday...Not seen, but man was the energy strong! Is there a way to post a copy of the award? Just save image, so we can post and also pass along? Weekly Spectre.. You are sweet too and I'll be watching for your guest blogs. You are welcome to guest blog here too if you just need to write more. Proudmomof3... I just right clicked and saved the image. Thank you Jessica! I feel honored to be among your favorite blogs. LOL! I'm so glad you DID pass it on to Andrea after all! I'm ROFLMAO because I felt so bad I didn't pass it to her to begin with (as well as a couple of others) that I did a second one giving it out! Yes, I AM a nut. Also VERY happy to see you tagged Julie too. She was another one I thought I should give one too, but then who would you or Alison pass it on to? (I don't even know why I thought this way. It had to do with one time we were all passing around awards and kept naming blogs over and over and making hard for each other to pass on to. I didn't want to hog them all up!) I know, I'm a colossal Dork! Congratulations, Jessica! Certainly, it's well deserved.